A couple of months ago, in the letters section of the January, 2014 issue of Practical Sailor, a man named Tripp Presnell laid out a number of significant concerns to do with safety tether systems on boats. (“Thoughts on PFD Design,” found on p. 7.) This is something I’ve thought a lot about, but without proper background, I’ve had only my intuitive sense with which to back up my own concerns. It was great to see a coherent explanation of the problems, and potential solutions. First, the problems. The issues are: harnesses that concentrate strain in unsafe locations on people’s bodies; distance of fall in a typical sailboat tether arrangement; and lack of elasticity in the tether system. My own concerns had been related to distance of fall, the abrupt stop at the end of the tether, and the problem of getting back aboard as a single-handed sailor on a moving boat, dragging. Yikes. I’ve responded to these concerns by trying, though not terribly effectively, for shorter tethers to prevent actually going over the side, and then by giving up on tethers almost entirely. Instead, I have focused on maintaining heightened awareness of not falling overboard, knowing that if I do, that will be the end of the ride, but measuring the risk of that bad ending against the concept of falling overboard with a tether, massive injuries to my rather delicate physical well-being, and the prospect of a truly horrific end of the ride. Obviously, neither possibility is anything one would want to do. The letter-writer in Practical Sailor brings rock climber background, as well as sailing knowledge, to this question. His letter was a great beginning, and with the clue to look at rockclimbing materials, I have since found a lot more good information on the Internet. He also talked about tree workers, and folks doing construction, and I found some interesting discussion coming from those groups, as well. The bottom line is that falling any distance – even 2 feet – into an abrupt stop on a harness creates enough force to cause serious injury to muscles, bones, and organs. There are formulas for calculating this force, truly surprising in the magnitude of their results. Added to that, if the harness is inappropriately fitted, so that the horizontal strap around the torso is too low, floating ribs are extremely vulnerable, can be snapped, and then even worse, their broken edges can be pushed into organs, causing great damage and internal bleeding. With an average sailboat tether arrangement, it would be more than easy to fall a distance greater than 2 feet. Further, sailing harnesses are often combined with inflatable PFDs. The appropriate position for anchoring the PFD is not immediately below your armpits, where an ideal tethering harness would be located, but lower. A woman of average height is likely to find that an inflatable PFD strap rests right at, or below, her floating ribs, just where it does not belong as a tether harness. There is a warning that comes with this gear, that users must be at least 5’8″ tall, but with no explanation of why – I hadn’t remembered that it was there (and it’s not included in the catalogs where they are sold). The bottom line is that tether harnesses, problematic in themselves, are seriously problematic for the average person when arranged as part of an inflatable PFD, except perhaps for tall individuals. Even then, it’s not ideal, just not quite as dangerous. The ideal tether harness, according to various sources, is not simple. Rock climbers use a harness that carries their weight at their hips, with wide, load-distributing straps around waist and legs. These are like the gear that some folks use for going up a mast. Chest harnesses as sole support for rock climbers have long since been abandoned, after numerous disasters. It turns out that worn slightly incorrectly, in a suspended fall a chest harness alone can compress a person’s rib cage, causing difficulty breathing, and resulting in very sad outcomes. Among rock climbers, upper body chest harnesses are only used as an additional, secondary part of the system so that a person is held upright in a fall, while their weight goes into the lower body harness. And often, rock climbers use only a lower body harness. On a boat however, a lower body harness, alone, is not appropriate. The tether attachment point ends up below a person’s center of gravity, which is a terrible hazard if a person is in the water, potentially being dragged by the boat, oriented head-down. That outcome is unacceptable, so the alternative that has been adopted is the upper body harness, with its risks of poor support during a fall, and the potential for resulting internal injuries. Apparently (though I haven’t done follow-up research on this), equipment failure in boat tethers used to be a big problem, due to the forces involved in a fall on a boat. Nowadays, the equipment is more heavily built; the equipment no longer fails, but injuries resulting from abrupt stops have escalated. Somewhat more ideal than the standard upper body harness is the strongly built upper and lower body harness for sailors, but gosh, what a production – and you still have the problem of abrupt stops. I’m still puzzling on the harness question, thinking about how the various considerations combine with the issue of the tether itself, and how to avoid ever going far enough in a fall to experience the problems of an abrupt stop. This brings us to the subject of the tether itself. The letter writer in Practical Sailor discussed rigging a chest-high jackline – which I took to mean over the cabin, but it’s possible that he meant something more like a chest-high lifeline along the perimeter of the boat. Either way, this would be an alternative to the typical sidedeck placement. If the jackline is down on the sidedeck, where it is often found, the problem is that the tether needs to be long enough to reach up from the deck to one’s torso. With the jackline so low, if you do go over the side there is a much longer fall – double the length of the tether – before that abrupt stop. This is much farther than the 2 feet that is already such a serious risk. If the jackline is led over the top of the cabin, the jackline is then closer to chest height, as well as allowing for a snugged up tether that only allows you to fall toward the boat, rather than going over the side at all. I have personally opted for a more central jackline, but have used a commercially available tether, which was of course much too long. Rock climbers use carabiners for the end attachments, but to me it seems worth considering using the typical specialized attachments on commercially produced boat tethers – a snap shackle with a beaded pull cord for emergency quick release at the harness end, and a clip requiring two maneuvers for opening, at the boat attachment end. Climbers use locking carabiners at the tether ends, which are secure but very tough to manage with wet, cold fingers, and when under strain they cannot be released at all. This is a serious consideration on a boat, if one were to be entangled under water. Snap shackles, on the other hand, are more likely to be releasable under load. Either way, a sailing knife close to hand is not a bad idea. The overall tether can be made at whatever length is appropriate to the situation, and with attention, the potential distance of fall can be negligible. This I like, and overall, I’m anticipating a more secure season of sailing. The letter in Practical Sailor also talked about elasticity in jacklines and/or tethers, as a way to reduce the force of a fall. I do think that perhaps the author was reversing things, on this, as he talked about nylon jacklines being a problem, and that polyester would be stretchier, and thus better. Numerous references state that nylon has more stretch, and polyester much less (nylon dock lines/polyester halyards, etc.). He did not get into that whichever material is the one with stretch, the characteristic of stretch is actually a bit different from elasticity. My own experience has been with commercially available nylon webbing jacklines which do stretch, but not when you want them to. You set them up snug, they get wet, and then need to be retightened (repeatedly). Stretch during a fall would be nice, but better would be a snug jackline with some give in the event of a fall. Something to do with a slightly elastic section built into the system somewhere. There is more to study on this, but for now it’s clear that if nothing else, the tether itself should be made of line with some stretch (I would choose nylon), and should absolutely not be made from low stretch material such as polyester/dacron, or the newer high-tech stuff. Rock climbing websites emphasize this point. My personal experience with nylon jacklines is from over 10 years ago. I see now that at least some commercially available jacklines are actually polyester. This seems problematic, unless elasticity is built into the system in some other way. Construction workers also use harnesses and tethers for protection from falls, and there is quite a lot of material about this on the Internet as well. Some construction tethers incorporate heavy shock cord to deal with the issue of abrupt stops. There are also many discussions related to dangers of being suspended in a harness for as little as ten or fifteen minutes after the initial fall, because of disruption of circulation by narrow straps. This has sadly led to many deaths. It’s not an easy subject, the safety tether issue, and has a surprisingly wide range of considerations, with possible severe outcomes if one does not get it right. The take-away from all this, for me, has been the focus on adjustable tethers that make it possible to keep oneself securely held on the boat, with minimal slack, thereby preventing falling even against the harness on the boat, as well as specifically preventing being able to fall over the side. A midships jackline and/or pad eyes, and a Purcell Prusik tether, with elasticity included one way or another, seems most promising. Meanwhile, the other interesting tidbit that I came across recently, related to safety tether strategy, is in Roger Taylor’s book, Mingming and the Art of Minimal Ocean Sailing: More Voyages of a Simple Sailor. This is another concept that is perfectly obvious once somebody says it, but had not occurred to me. Ever since sailing a 24 foot Bristol Corsair, I’ve spent a lot of time puzzling over how to be secure on the foredeck of a boat. 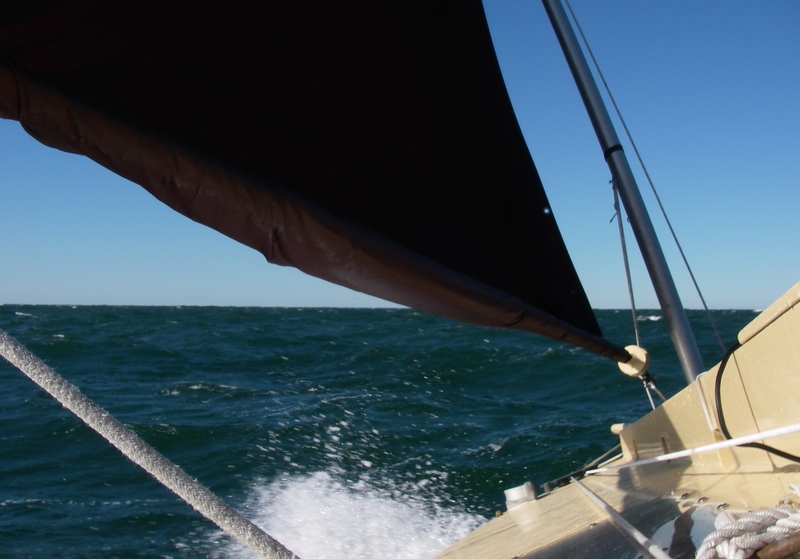 I had a near miss on that boat, singlehanding in the dark – and on the bow of most any small sailboat the possibility of going over the side is ridiculously close, in three directions. One friend likes tethering to the mast, but from my perspective, that’s not quite so good for if you need to be right up toward the bow (tether too long, and worse, behind you). On the other hand, there was Roger, discussing going forward, with TWO tethers. This is common, for leapfrogging forward, with one tether always attached. However, what Roger did is that once he arrived on the foredeck, he sat in the middle, with one tether clipped in on each side, port and starboard. (Maybe everybody but me knows this?) From there he proceeded to carry out his jib project. How is it that I never thought of that?? Attachment points may need to be added to the boat in the right places, to accommodate this idea, but that’s a relatively small matter once you know what you need, at least while the boat is still in the driveway. There is even another project in mind that could make double use of attachment points in those locations. Aboard AUKLET, this might or might not make perfect sense – the bow area is so small, and the mainmast so very close – but I sure wish that I had come across this concept when I was sailing a sloop, with a foredeck that made it a real puzzle. The “two tethers” strategy could come in handy in a number of situations. As a result of all of the above, I am feeling like the lights have finally been turned on over this question of safety tethers. It’s a good thing – it’s never been safe going without, nor has it been particularly safe going with. I’m perfectly delighted to finally feel like there’s a roadmap to some more satisfying answers to this question. http://www.practical-sailor.com at this writing, there is a glitch with the online version of the January 2014 letters section – hopefully they’ll straighten it out, as the letters appear to otherwise be available to non-subscribers. Note: just like everybody says everywhere, the ideas presented here are personal reflections, and do not constitute any kind of professional advice. It is each individual’s responsibility to use their own judgment regarding techniques and equipment for staying safe on boats, or on land. For professional advice and expertise, seek these from a professional – not from a personal boating blog! Above all, pay attention to what you are doing, use redundant methods for critical applications, and think through the potential consequences of whatever strategies you put to use. Thanks for this post. There is so much to digest, I will come back to it. Harnesses are such a double-edged sword, in that they hinder as much as help, unroll they’re needed. I read somewhere recently of someone having jacklines in the rigging (Pardys’s?? ), I will try t find out and let you know. For unsinkable boats like Mingming, a harness system is more relevant than a life vest. I’ll be very interested to hear what you find! PS And then there’s MING MING! And other folks who say that if they are wearing a harness and tether, then they do not wear a PFD. To me, that assumes that one is doing an outstanding job of having the safety tether attached at*all* times… Myself, I am utterly horrified at the concept of, if gone overboard, drowning because of paralysis due to cold water. If it were to happen, I’d rather die floating, and have the outside miracle chance that I might make it out of the water again. So I wear the lifejacket, and add the harness and tether. It seems like a very personal decision, based on both acceptable risks, and knowledge of oneself, as far as being able to be sure that one is tethered at every moment on deck or in the cockpit, if not wearing a PFD. Lots to ponder!